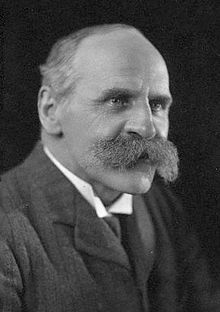 John Scott Haldane CH FRS (/ˈhɔːldeɪn/; 2 Mey 1860 – 14/15 Mairch 1936) wis a Scots pheesiologist famous for intrepid sel-experimentation that led tae mony important discoveries aboot the human bouk an the naitur o gases. ↑ Douglas, C. G. (1936). "John Scott Haldane. 1860-1936". Obituary Notices of Fellows of the Royal Society. 2 (5): 114–139. doi:10.1098/rsbm.1936.0009. JSTOR 769132. ↑ Acott, C. (1999). "JS Haldane, JBS Haldane, L Hill, and A Siebe: A brief resume of their lives". South Pacific Underwater Medicine Society Journal. 29 (3). ISSN 0813-1988. OCLC 16986801. Retrieved 12 July 2008. This page wis last eeditit on 4 November 2017, at 05:03.